Closed captioning and visual-impairment assist devices now available! The Strand Theatre has installed closed captioning and visual-impairment assist technology in its auditorium to allow patrons that are deaf or hard of hearing, or are blind or have low vision, an opportunity to experience a wide array of film events presented at the Strand. Purchase of the equipment was made possible with grant funds received from Fisher Charitable and Bangor Savings Bank Foundations. 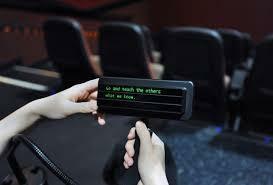 The installation of the equipment follows an ADA (Americans with Disabilities Act) amendment announced by the former administration’s Department of Justice that requires movie theaters to provide closed movie captioning and audio description in order to give persons with hearing and vision disabilities access to the programming on offer. "This proposed rule will allow all Americans, including those with disabilities, to fully participate in the movie-going experience. With this proposal, the Justice Department is taking an important step to ensure consistent access for people with vision and hearing disabilities," said Attorney General Eric Holder. Closed movie captioning is the display of the written text of movie dialogue and other sounds delivered via individual captioning screens used by patrons at their seats, instead of being displayed to the entire audience on the main screen. Visual-impairment assist technology provides audio description, transmitted to users through infrared wireless headsets, enabling individuals who are blind or have low vision to enjoy films by providing a spoken narration of key visual elements of a film, such as actions, settings, facial expressions, costumes, and scene changes. Audio description fills in information about the visual content of a movie where there are no corresponding audio elements in the film. According to Strand Theatre Executive Director Jessie Davis, “While the proposed ADA requirements allow for exemptions from compliance based on theater size and annual income, under which category the Strand would fall, we believe that these technologies promote equity, human dignity, and fairness and it is essential for us to offer these enhancements in order to best serve all our current and future patrons.” It is estimated there are more than 53,000 visually/hearing-impaired adults living in Maine. In addition, Maine has the oldest population in the country. “As our audience is aligned with this statewide trend, we will only see the need for closed captioning and visual-impairment assist technology grow. It is important that the Strand be a place of inclusivity within the community, which is why this accessibility project has been a priority for our organization,” Davis said.